Publisher: Devious Weasel Games. Designer: Jim Felli. Year Published: 2018. Players: 4-6. Time: 30min. Age: 14+. WEIGHT: 2/5. POST BY DAVID. I’ve always enjoyed social deduction games. Avalon was (and still is) a favorite of mine when I was getting back into board games. I loved the idea of having a secret agenda, bluffing my way out of a situation, holding back maniacal laughter as the good guys got accused. We’d play it almost every week at my game night. Some of those people have moved, but when they come back for a visit it’s the first game that goes in my bag. So when I saw there was a new game of bluffing and take that coming to Gen Con 2018, it quickly went onto my most anticipated list. I don’t hear much chatter about this game. I didn’t hear much about Bemused either (which it draws its origins from). Perhaps it’s the euro looking cover, or the dry title which gives no impression of the horrible backstabbing that will soon come into play. Whatever the reason, DUHR deserves to be noticed. It deserves to become one of your favorite end of the night games. It deserves to be played. A lot. By many people. 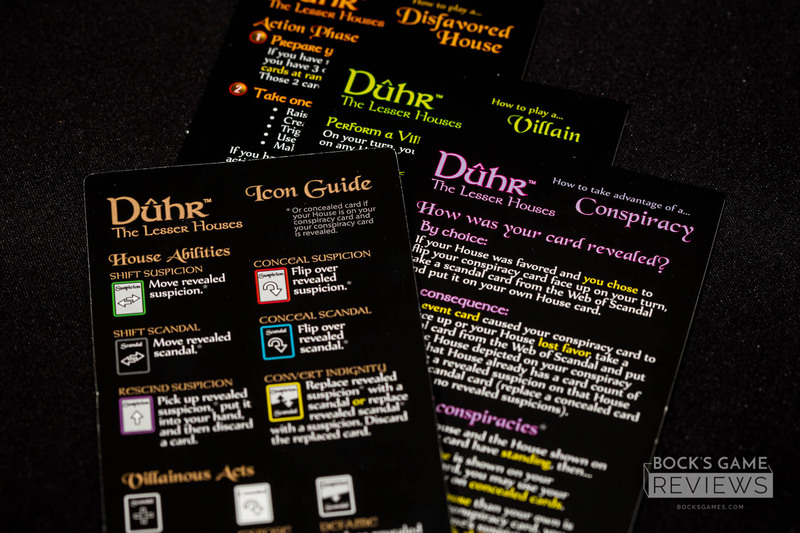 DUHR: THE LESSER HOUSES (pronounced D “oo” r, like doom) is a game that focuses on being an awful person to your friends, making alliances and then double crossing them at the last moment. Unlike Sidereal Confluence, there is absolutely no penalty for betraying someone. You’re encouraged to. And that’s where this game stands out from the rest. You can make any sort of deal you want. Trade whatever you like. Be horrible. Be awful. Be cruel. Reap the benefits. 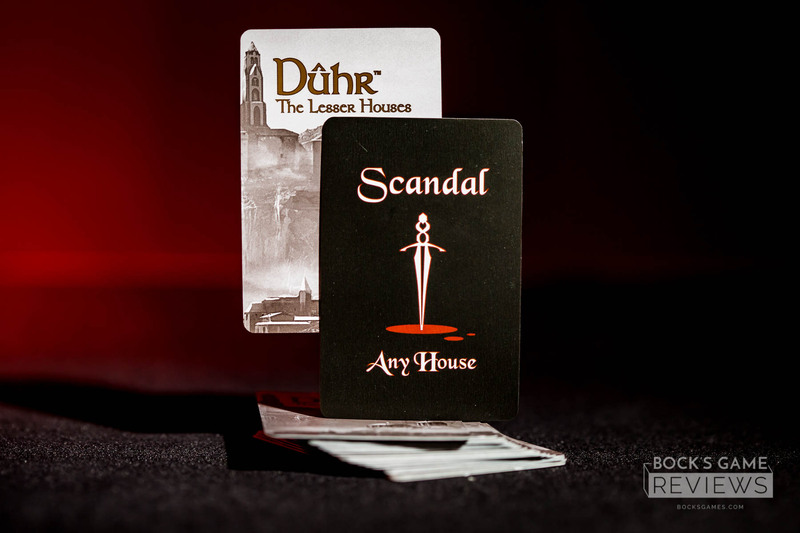 At first glance DUHR seems like a simple card game. But it’s deeply thematic, and relatively heavy for the category. 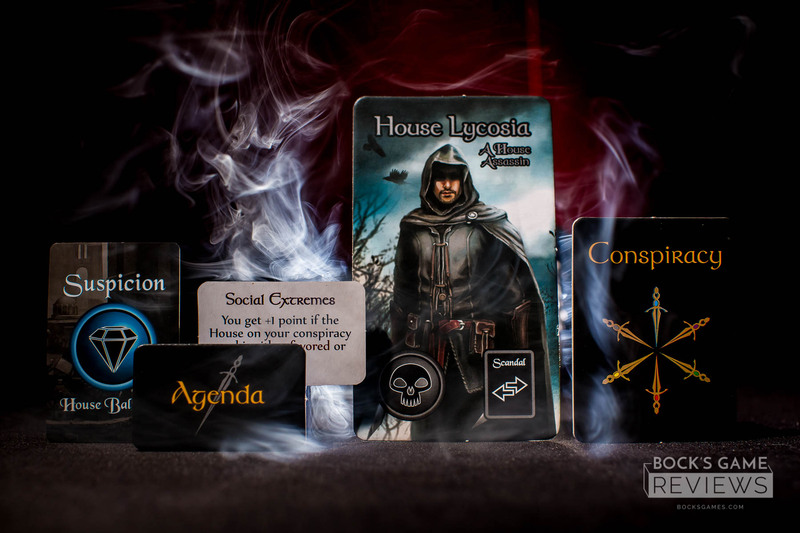 You’ll be given a house with a special ability, two secret objectives, and a “conspiracy” which gives you a second ability to use later in the game. Your goal is simple. 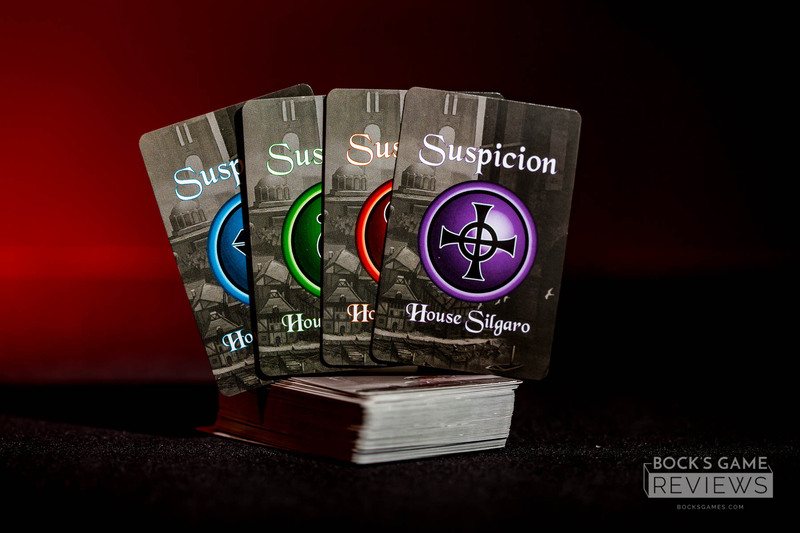 Play suspicion and scandal cards on your opponents houses and avoid having them played on yours. If someone gets five cards, their house is disfavored. 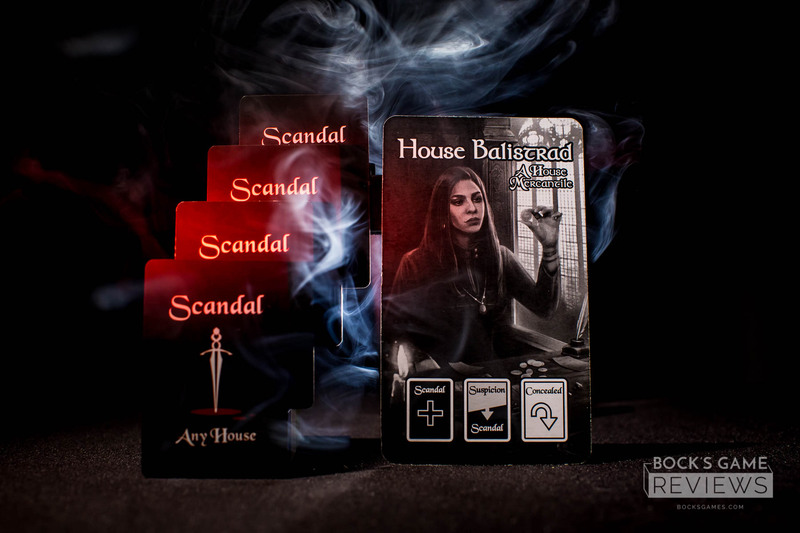 If more than three of the cards on your house are scandals, your house is vilified and you must flip over your house card, discard all cards from your hand and have a limited set of actions — albeit very powerful ones. 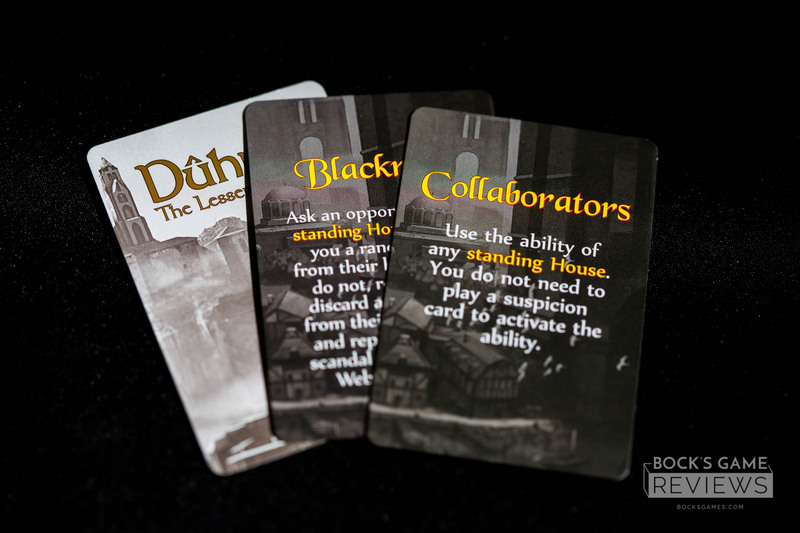 And with each house having a unique ability you’ll be making alliances any chance you get to keep those cards from landing in front of you. The game ends when only one house (or none) is favored. 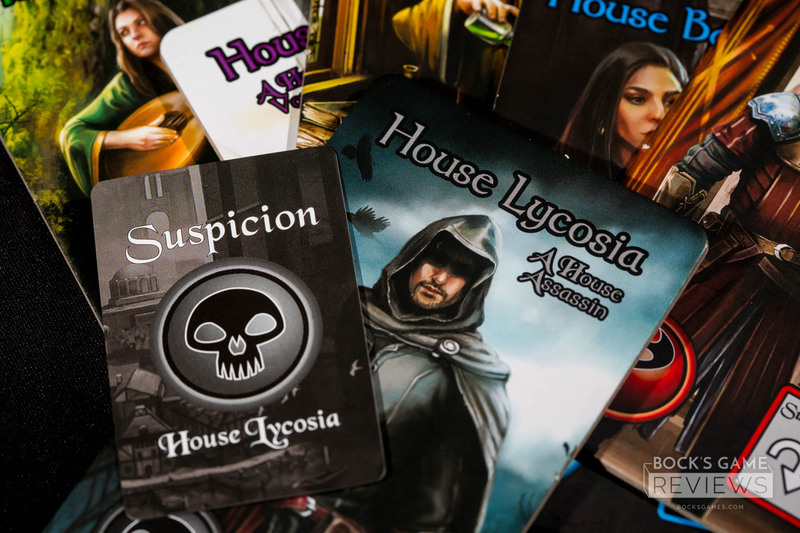 Then points will be added up based on your house standing or villainy — and be aware, the most evil of players can potentially win it all. Events will happen at random to turn the tide. Players will throw down master strokes which give power actions or act like the nope cards from exploding kittens. And then you can get your nope noped or someone will nope the noped nope. It’s insane. And it’s brilliant. 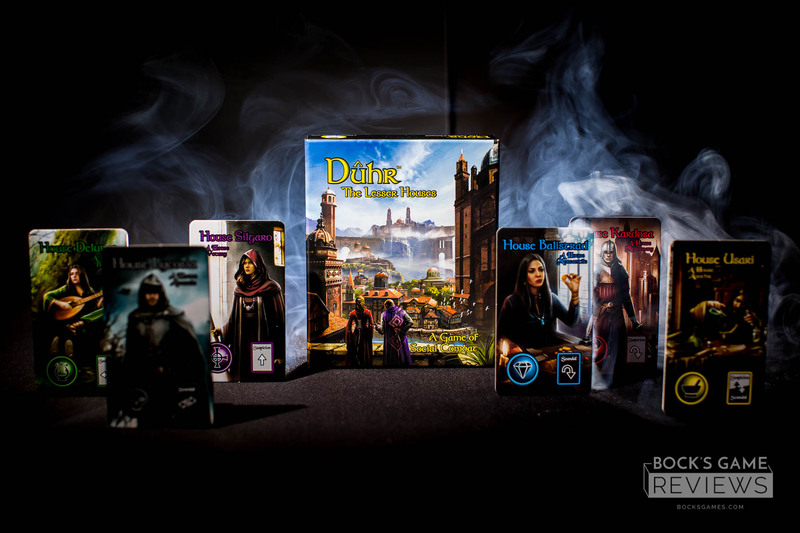 Duhr is not a quiet game. It’s filled with trash talk, bringing up old games for black mail, king making (when you’re really just bribing an ability for one turn), and doing whatever it takes to win. Every turn makes you cringe, makes you gnaw your lip and bite your knuckles. Even better, it feels fast. Really fast. But make no mistake, this is not what I’d consider a filler game. It takes a bit too long to explain to qualify as one and you’ll immediately want to play it again. Of course, this like many social games is only as good as what you bring to it. It requires 4 – 6 players which is usually a deal breaker for me. It won’t work to it’s full potential with a group who likes to stay quiet and nice. It’s desperate to have people stand up and yell at those who betrayed them, or happily back stab their best friend, or promise to do a thing …and then do another thing that wins them the game. On the down sides, while the art is decent, it’s not amazing. It’s not bad or distracting but it isn’t eye catching either but it’s no better or worse than Avalon or any other social deduction games. Still, it’s very legible (which I always appreciate), gives that dark sense of intrigue, and the massive player aids are great to remind yourself or new players what they can do on their turns — because this game does have a bit of a learning curve. Does this game have the magical evergreen powers of Avalon or One Night? Probably not. It’s got that learning curve. You can’t explain it in five seconds. It’s a bit longer, a bit heavier, and not as quick and simple as the mass market typically demands in this category. It’s not as “fun”. It’s mean. It’s ruthless. It’s petty. But this is also what I love about it. It’s unforgiving horribleness. 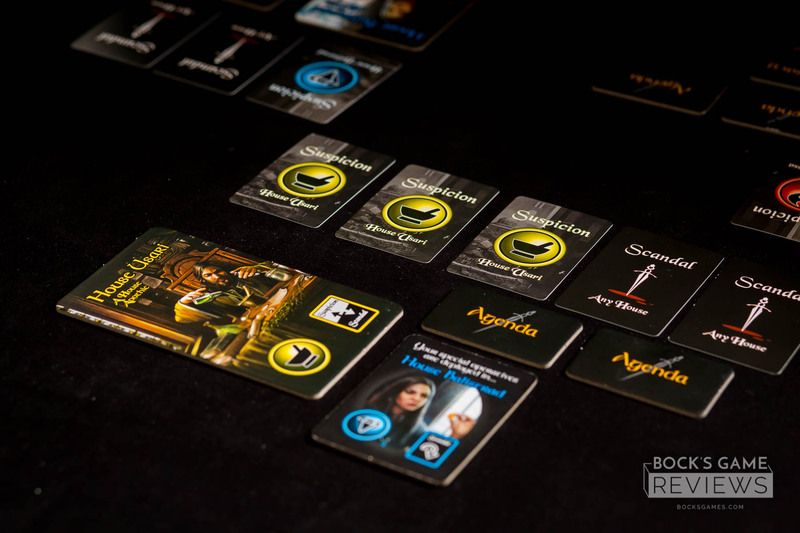 So with that said, if you’re wanting that “betray your friends” party game feel, plus a heck of a lot more, wanting to be something other than Merlin or a Werewolf — then this is the game for you.